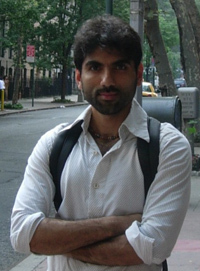 In this episode of NRI’s=New+Returned Indians, we talk to activist Vivek Gilani who moved back to India after more than a decade in the U.S. – having taken a sabbatical from working on water issues in his beloved New York – to pursue his development projects in Mumbai. Vivek runs www.mumbaivotes.com and is building a carbon footprint calculator. We talked about jazz, alienation, the Mithi River, Central Park, being told he’s got a ‘foreign attitude’ and how the monsoon and mangoes make being back worthwhile even while he’s had to pick his battles. Download or stream the interview to learn why he’s back and the challenges he’s faced returning after so long. I noticed a site dedicated to Indian based entertainment series. There were a number of clips based on Indian movie comedies. Take a look at http://www.TajTube.com. Check it out. I think I know the guy named Vivek Shangari from bangalore. He is very intelligent.